CapPlus equips financial institutions in emerging economies to expand and deliver finance profitably for social impact. We strengthen markets through a range of strategic and operational capacity building services to financial institutions in key areas, focused on long term growth and profitability. We are an international 501(c)(3) nonprofit originally founded by the USA’s first community development bank, ShoreBank. Today we work with financial institutions, investees of impact investment partners like the ShoreCap funds, and industry stakeholders worldwide. We have a track record of innovating and mainstreaming development finance solutions. We launched the first membership network for financial institutions dedicated to financing SMEs in emerging economies. We tested and scaled this concept to over 60 institutional members, then merged it into the G-20’s SME Finance Forum, managed by IFC. Now we’re also focused on education. Our Education Markets Impact Initiative (EMII) uses finance as a tool to drive improved outcomes for millions of children. Grounded in country-specific research and our expertise in development finance, this new initiative unlocks the education finance market while increasing education access and quality. We thank our past and current funders, partners, and financial institution clients for their support and for the impact we’ve made together. The CapPlus team works hand-in-hand with our clients and partners to overcome challenges for the shared purpose of increasing finance to SMEs. Ms. Pikholz, founder and CEO of CapPlus, is an emerging economy small business finance expert and specialist in market-based poverty reduction strategies. Lynn brings over 25 years’ experience in micro and SME finance, including a focus on women entrepreneurs and the intersection of affordable education and SME finance. Currently, Lynn is leading CapPlus’ launch of EMII (Education Markets Impact Initiative) to use finance as a driver of cost effective and sustainable improvements in learning outcomes, transforming the affordable education finance market. Ms. Pikholz has developed and led trainings, published papers, and recently directed extensive research on low fee schools in sub-Saharan Africa. CapPlus’ Small Business Banking Network, comprising SME-focused financial institution members from emerging economies, was established under her leadership before merging into the G20’s SME Finance Forum. Ms. Pikholz’s earlier experience and publications includes MSME finance, impact investing, financing of affordable education and low-income housing. Raphael Akomeah has been working with low-cost private schools for over nine years, managing Sinapi Aba Trust’s low-cost school finance program and serving as CapPlus’ education finance consultant and IDP Foundation’s projects manager in Ghana. He implemented the IDP Rising Schools program in 18 Sinapi Aba branches, managing a loan portfolio of 398 loans totaling $1.2 million that maintained a 92% repayment rate. He also created a loan database for decision-making and reporting. Mr. Akomeah worked closely with school proprietors, delivering extensive school management training to more than 600 school entrepreneurs that covered financial management skills, business planning, operational best practices, and teacher training on child-centered instructions. Dr. Colenso is an international education expert with field experience in Africa, Asia and Europe. He was Executive Director (Education) at the Children’s Investment Fund Foundation and Head of Education at DFID. His track record includes the World Bank, UNICEF, Government of Australia, Bill & Melinda Gates Foundation, LEGO Foundation, Sesame Workshop, Ark, and the Global Schools Forum. He has a history of building innovative partnerships with governments, multilaterals, civil society and the private sector. Ms. Dababneh is an international development specialist, practitioner and program manager with over 20 years of professional experience in MSME finance, banking, private sector development, economic growth, and programmatic and financial management. During her years as a Regional Director at CGAP and a Senior Financial Services Advisor at Development Innovations Group (DIG), Ms. Dababneh managed capacity building programs to financial institutions, including microfinance institutions, in North, East, and South Africa, the Middle East, Central and Eastern Europe, and Central and Southeast Asia. She has extensive technical experience in leading public and private sector financial and economic development programs, with comprehensive management skills in all aspects of operations, including strategic planning and budgeting. Ms. Godlove has more than 15 years’ experience in international development, managing high impact projects in over 40 countries. She applies her project management and technical expertise in leading CapPlus’ capacity building practice. Ms. Godlove’s technical expertise covers strategy (development and execution); fund and debt facilities design and management; education, health and green technology sectors; and evaluation and research methodologies. She also has hands-on experience in public and private financial advisory services, private sector engagement, and public-private partnerships. In the past, she worked for PricewaterhouseCoopers Limited in East Africa, Cardno (formerly Deloitte Emerging Markets), the World Bank and FHI 360, and has extensive experience as an independent consultant with clients such as Enclude, Millennium Challenge Corporation, USAID, and Uganda Revenue Authority. Peter Hinton has worked with CapPlus over the past decade and is currently CapPlus’ Senior Advisor of Affordable Education. In addition to his expertise in low-fee schools, he is an investment specialist and former African fund manager with a background in private equity investment and banking, with more than more than 25 years’ emerging market experience. Previously Mr. Hinton was CEO and founder of Enterprise Banking Group, a Botswana-based regional banking group that invested in banks in Kenya and Botswana. He also worked at CDC plc, a private equity investor in emerging markets and four years as Managing Director of Africa Trading, a South African fair trade business that won awards and international recognition. He currently heads up the Summit Development Group and serves as a core part of CapPlus Education Markets Impact team. Andrew Lake is CapPlus’ lead on digital financial services, including digital finance strategy and institutional assessments as well as design and delivery of digital finance solutions. With 20 years in emerging markets and deep experience in digital financial services, his core strengths are strategy design and execution around novel, customer-oriented digital products. He previously worked as the Principal Operations Specialist on IFC’s Global Digital Financial Services team, as well as with Risk Frontier Associates UK, MTN Group and CmO MTN Banking, and CompuServe Africa. Gerry Monteiro has worked with CapPlus since 2006, including as Vice President Capacity Building, and now serves as investment head on CapPlus’ Education Markets Impact Initiative team. He has over 40 years’ experience as a banking executive in South Asia, Middle East and sub-Saharan Africa. Mr. Monteiro’s experience includes setting up the Industrial Bank of Oman, an investment banking and project finance institution in the Sultanate and serving as its first CEO. He was HSBC India’s Financial Controller and Chief Operations Officer and subsequently its Deputy CEO, managing all geographical and functional business units in implementing the strategy. He has led a number of start-up and turnaround assignments within Africa and Asia based financial institutions (commercial banks and non-bank finance companies) as well as strategic re-organization of both large and small banks in emerging markets. He has extensive risk management, credit, technology, and investment experience. Ms. Railsback has more than 25 years’ experience in development finance, many of them at ShoreBank Corporation where she led implementation of major strategic initiatives, including strategies to serve new customer segments as well as marketing, IT and human resources strategies. At CapPlus, she coordinates CapPlus’ low-fee private school market research and manages thought leadership and corporate communications, as well as leads the performance and impact measurement initiatives. Geoff Renk oversees CapPlus’ accounting and finance activities. He is a licensed CPA with over 30 years of accounting and finance experience, including more than 15 years in a bank senior management capacity. Mr. Renk’s areas of expertise include accounting, finance, regulatory reporting, income taxes, accounting and reporting systems, and risk management. He has worked with CapPlus since 2003, initially setting up its accounting and reporting system, and later in an oversight capacity as its chief financial officer. Earlier in his career, he worked in national and international accounting firms, and provided accounting and consulting services to a broad range of clients, including financial institutions, real estate firms, and not-for-profit organizations. His consulting assignments included evaluation of loan portfolios, transaction due diligence, asset workouts, litigation support, and strategic planning. Ms. Theodhori plays a key role in the capacity building business, working closely on management of all capacity building projects and pipeline projects. She also supports in the development and writing of grant proposals and reports, as well as other projects such as CapPlus’s peer learning events. Prior to CapPlus, Ms. Theodhori supported the formulation, management, and implementation of all youth employment project activities for the International Labour Organization in the West Bank and worked with entrepreneurs at Alpha Bank, a commercial bank in Albania. Ms. Christman has over a decade of experience in the education and publishing fields. She has taught at NGOs, elementary schools, and university extension programs, leading workshops and serving on advisory boards. In addition to being a small business owner, her experience includes meeting planning, HR, web development, accounting and administration. CapPlus has a highly committed, experienced and diverse board, both in skills and geographically. Eric Friedenwald-Fishman (Board Chair) is the creative director / founder of Metropolitan Group. Since Metropolitan Group’s founding in 1989, Eric has served as the key strategist and campaign counsel on hundreds of international, national, and regional projects, and he has developed extensive relationships with nonprofit, corporate, public sector, and philanthropic decision makers. Eric has worked extensively on economic development, development finance, social enterprise, poverty alleviation, food security, public health, human rights and education access and equity campaigns and programs. His clients have included Ford Foundation, World Agroforestry Centre, NASA, USDA Forest Service, IFC and numerous NGOs. He has served as creative director of initiatives in Latin America, Africa, SE Asia and North America. He has led resource development campaigns that have raised over nearly $2 billion in philanthropic and public sector investment for social impact initiatives. Eric is the author of Marketing That Matters (published by Berrett-Koehler in five languages) and is the principle author of the Public Will Building model, a social change engagement approach used internationally to advance systemic changes. Karim Ahamed is a Partner and Investment Advisor in the Chicago office of HPM Partners LLC, a leading registered investment advisory firm. Prior to joining HPM Partners, he was a managing director with J.P. Morgan Private Banking, Chicago. Karim has spent a considerable portion of his career in the UK, where he held senior investment and wealth management positions with Coutts & Co and UBS AG. Karim received his Bachelor of Arts degree from the College of William & Mary and his Master of Management degree from Northwestern University’s Kellogg School of Management. He is a CFA charter holder and member of the CFA Institute, the CFA Society of Chicago and the UK Society of Investment Professionals. Cyrille Arnould is Head of the GEEREF Front Office team. Advised by the European Investment Bank Group, GEEREF is an innovative Fund-of-Funds catalyzing private sector capital into clean energy projects in developing countries and economies in transition. Previously, he was a Senior Officer at EIB’s Africa, Caribbean and Pacific Department, where he oversaw the development of private equity and microfinance portfolios. Prior to joining the EIB in 2003, Mr. Arnould was a Senior Investment Officer at the International Finance Corporation’s SME Department, which he joined after four years with IFC’s Financial Markets Group, Sub-Saharan Africa Department. He was previously IFC’s Senior Investment Officer based in Russia. Before joining IFC, Mr. Arnould worked in Russia for the European Bank for Reconstruction and Development, first as Investment Manager for Smolensk Regional Venture Fund and then as Principal Banker in Moscow. Mr. Arnould holds a Diploma from the Political Science Institute and a Master’s in Law, both from the University of Strasbourg, and an MBA from the Wharton School of the University of Pennsylvania. Nicholas Burnett is now an independent consultant, a Senior Fellow at Results for Development (R4D), a Founding Partner at Oxford Philanthropic, chairs the Board of UNESCO’s International Institute for Educational Planning, serves on the Boards of Educate! and Americans for UNESCO, on the NORRAG Consultative Committee, and on the Advisory Boards of the United Nations Association of the National Capital Area and of the Global Business School Network, and is a Special Professor of International Education at Nottingham University. He was previously Managing Director at R4D (where he founded the Global Education Practice), UNESCO Assistant Director-General for Education, Director of the Education for All Global Monitoring Report, and World Bank Human Development Manager for West and Central Africa. He was educated in economics at Oxford (BA), Harvard (Henry Fellow) and the Johns Hopkins University School of Advanced International Studies (MA, PhD). Jennifer Hoffmann is an independent digital finance consultant with RiskFrontier Consultants Ltd after a career in management in various innovative financial institutions, which included CEO of TEBA Bank and of MTN Mobile Money in South Africa. Her consulting work focuses on technology for accessible banking, including branchless banking and mobile banking, business strategy, regulatory issues, and the establishment, growth and transformation of microfinance institutions. Her objective is to bring the strategic approach and methodologies of user centered design to the institutional capacity and product and delivery channel design. She has worked with the IFC, Finmark Trust (South Africa), CGAP, and a broad range of financial institutions in Africa, Asia and Eastern Europe. Matthew Nell is the Founder & Director of Shisaka Development Management Services in South Africa. He chairs the board of Arrowhead Properties, a Real Estate Investment Trust, listed on the Johannesburg Stock Exchange. He has over thirty years of experience in development finance inclusive of urban and housing development and microfinance. Mr. Nell oversaw the establishment of key housing finance and micro-credit institutions and public funding interventions. Mr. Nell has also been responsible for the overall management and direction of the National Housing Forum, which was responsible for negotiating the new National Housing Policy and assisting South Africa’s new democratically elected government. Through Shisaka, Mr. Nell’s consultancy work has provided advisory services to the state, the private sector and the non-governmental sectors. Natasha K. Quist has over 25 years of international private and NGO management experience. Currently, she is the Senior Advisor for West and Central Africa for the Bill & Melinda Gates Foundation based in Abuja. Prior to joining the Gates Foundation she was the West and Central Africa Regional Director for Save the Children International, based in Senegal and covering 11 countries (Burkina Faso, Central African Republic, Cote d’Ivoire, Democratic Republic of the Congo, Mali, Niger, Nigeria, Senegal, Sierra Leone, Liberia, Guinea). She was highly successful in scaling the World Wildlife Fund Program in Africa, as its Regional Director where she was responsible for 28 field offices staffed by over 300 people. Ms. Quist began her career on Wall Street, where she worked for various firms, including Salomon Brothers. She later worked for Walt Disney Company, and Nike Inc, where she focused on strategy, business planning, and new business development. Ms. Quist holds an MBA from the Wharton School of Business and a BSc from Leeds University. With decades of deep, cross-cutting experience in the SME Finance space, we deliver high-impact results targeted to clients' key priorities. Ms. Anderson has over 25 years’ experience as a training and HR expert with assignments in the Middle East, Asia, and Africa. She has worked extensively with financial institutions providing training and consulting on strategic human capital management and operational HR/performance management, leadership coaching for CEOs and senior managers, and executive and management development training. She is a training expert for financial institutions, providing tool development and knowledge exchange services to MFI and SME institutions, as well as developing handbooks, tools and other learning and development resources. 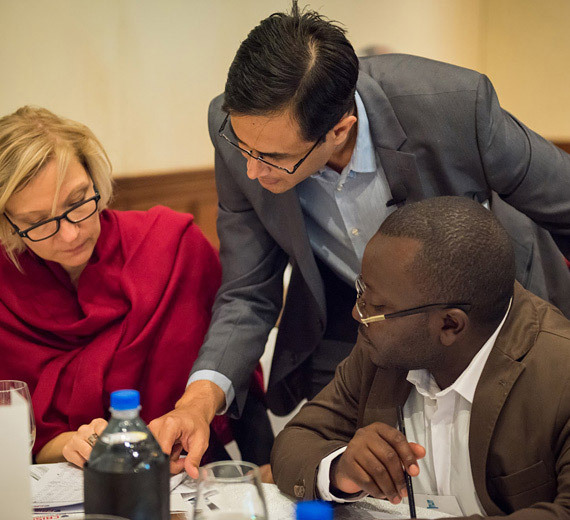 Sumit Bagchi has worked with CapPlus over the past decade to deliver information technology solutions to our clients and other development organizations, including embedding impact measurement into financial institutions’ MIS. His 18 years’ experience in the financial sector gives him a strategic understanding of technology and its application and delivery for achieving overall business objectives. Mr. Bagchi designs and implements IT systems ranging from simple to complex, transitions organizations to digital operations, and develops IT strategies and manages their implementation. Financial institution clients include microfinance institutions, banks, and leasing companies in Africa, India, East Asia and the Pacific. Ms. Dicdiquin has more than 20 years’ experience in banking, and has held senior management positions in rural banks and development banks. She has implemented capacity building projects for MSME-oriented banks and nonbank financial institutions in Asia and Africa, with project scopes largely focused on SME banking diagnostics, MSME product development, credit and credit risk management, staff capacity building, performance management, internal controls, customer relationship management and branch operations. Dr. Joanna Härmä has researched low-fee private schooling for the poor in sub-Saharan Africa and India since 2004 and leads CapPlus’ education markets research across Africa, as well as serving as an advisor to the EMII team. She is an Honorary Fellow at the Centre of African Studies, University of Edinburgh, and Visiting Research Fellow at the Centre for International Education, University of Sussex. Dr. Härmä’s work is published in the Oxford Review of Education, the International Journal of Educational Development, and the Handbook of International Development and Education, among other academic journals and edited volumes. She has designed and conducted studies for DfID, developed reports for UNESCO, and served as a Visiting Scholar at Columbia University. Roger Keighley is a key member of CapPlus’ Education Markets Impact Initiative, where he is responsible for sourcing deals, conducting due diligence, structuring transactions and implementing/ managing capacity building. He has over 30 years’ experience in SME finance, corporate, and investment banking, and was previously Norfund’s Investment Director, Financial Institutions, where he identified equity and debt investment opportunities in financial institutions and conducted due diligence on potential investees. Mr. Keighley has strengthened SME finance at multiple financial institutions, primarily in Africa. In his various investment capacities he has monitored the implementation of transactions, managed investment portfolios and advised an international banking consortium bidding to purchase a microfinance bank through privatization. He has held bank and insurance company directorships in Lesotho, Botswana, Zimbabwe and Tanzania and serves as chair of a bank board’s risk committee. Ms. Miller is a commercial banker and financial consultant with over 30 years of banking and international development experience. She has conducted SME diagnostics, developed market segmentation strategies, SME banking strategies, created financial products and cross-selling strategies, revised operating procedures, and developed case studies, including on affordable private primary school finance models. She also applies her expertise to value chains, developing new sources of credit, structuring appropriate financial instruments and procedures, identifying alternative collateral and increasing access to finance for SMEs, agricultural producers and agribusinesses. She has extensive experience in designing, using, and evaluating credit enhancements, as well as host government, provincial, and donor guarantee programs. Additionally she is an experienced training developer. Mr. Orlesky is a seasoned micro- and SME banker with over 30 years’ global experience both as a banker and consultant, including his role as CEO of two European banks over a six year period. His in-depth experience as a “bank operator” makes him well qualified to advise bank partners on many aspects of their operations. Recently, Mr. Orlesky has been actively involved in consulting financial institutions in sub-Saharan Africa on various aspects of banking, including lending policies, processes and workflows and appropriate corporate governance structures. Ian Paddick is an SME credit specialist with over 30 years of experience in commercial banking, half of it in Africa. He is an expert in credit risk analysis, credit process review and re-engineering and portfolio management. He is also an accredited trainer and skills coach. Previously, he served as Credit Director and in other senior credit positions for Barclays Africa in Botswana, Ghana, Mozambique, South Africa and Uganda. His responsibilities included portfolio management and monitoring, building lenders’ credit capability through training and coaching, designing early warning procedures and re-engineering credit processes. He has served on various country executive and credit committees. Prior to his credit responsibilities, he worked as Head of Local Business and as Corporate Relationship Manager for Barclays in the UK, among other banking roles. Ms. Toomey-Mys is a development finance expert with over 25 years’ experience building and growing financial institutions’ financial and business development services to micro, small and medium-sized enterprises. Risk management, product development, market analysis, program design, fund management and institutional assessments are some of Ms. Toomey-Mys’ key areas of expertise. In addition, she established and managed a women entrepreneurship development program in Ethiopia, assessed and prepared human resource policies, procedures and guideline manuals for a microfinance bank in Papua New Guinea and transformed microfinance institutions into for profit operations. She has created SME, commercial, agriculture and rural lending units, established microfinance institutions, and provided a wide variety of capacity building within financial institutions in Africa and the Middle East, South and Central Asia, the South Pacific and Eastern Europe. Her experience includes implementing projects funded by DFID, the WorldBank/IFC, USAID, and the Bill and Melinda Gates Foundation. Mr. Vaci has a 35-year international career with experience in 50+ countries across four continents. He is an expert in customer relationship management, executive management, business development, marketing and sales. He has built eleven SME/retail banks in Eastern Europe and the Commonwealth of Independent States and is former Director of CRM for 26 EMEA countries at Citibank. He has served in senior management positions to CEO / Board Chairman level, and is an internationally recognized presenter, author, trainer and MBA lecturer. Mr. Wyer is a results oriented professional with over 20 years of global experience in leadership and consulting roles in banking and development finance. He is a strategic leader that approaches problem solving with a hands-on, entrepreneurial attitude that delivers results that are effective and profitable. He has successfully built and run impact development funds in Sub-Saharan Africa and has designed and implemented bank development programs for IFC in Africa and Asia. Mr. Wyer has experience working and living in North America, Europe, Asia, Africa and Russia and has the proven ability to diplomatically and effectively work across various sectors with all levels of international/local business leaders and governments.